Massive smoke output from 1 unit! Need to have for Airsoft! 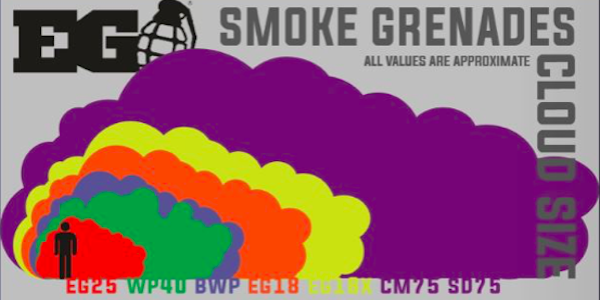 Enola Gaye extended the smoke range with the new CM75 & SD75 now added to the range. If you need monster smoke from one unit, it's now available with one pull of the pin. 3 times that of an EG18X, that's more smoke than most can handle. Check the comparison chart above. The new Cloud Maker series delivers huge quantities of smoke, more than any other product that they have manufactured in the past. The SD75 is available in 8 colours with additions to be added in 2018. With a top pull ignition pin covered by a foil wrap, the SD75 has been designed to produce more smoke than even military grade smokes!! And totally in line with the bio BB's in the world of Airsoft, EG is announcing all of their plastics will become bio-plastic. They've been working on this for several years now and are pleased to announce that it's already in production. All single use plastic parts will be made from a corn based bio-plastic. The plastics bags will also become D2W biodegradable bags over the course of the year.